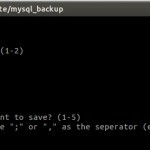 Here is a nice tool to backup your mysql-databases. with this simple script you have 2 options. before the easy mysql backup will start, the script show you the command that will be execute (see next screenshot). You can use this as a template for sheduling a backup in the crontab.